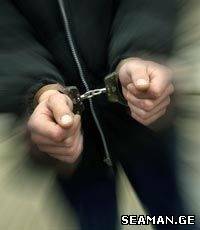 Police have detained two people on charges of fraud and extortion. They used to extort money from citizens in returns of promising to provide employment to them. Merab Dudaev, 48, previously sentenced for disorderly conduct and robbery and Zaza Gergishvili, 37, offered citizens jobs in Tbilisi Bus Ltd., in return of GEL 100. Both of the detainees have already admitted to the crime. In case if considered guilty, the suspects may face imprisonment from 4 to 7 years. Representatives of the investigative department of Georgian Finance Ministry have detained individual entrepreneur Jemal Giguashvili on charges of illegal realization of gold items of Gel 12 thousand. As reported, the detainee took Gel 300 from a citizen in advance and handed over large amount of gold items to him without issuing an invoice. Traditional Monday briefing was held at the Georgian Foreign Ministry. Deputy Minister Nino Kalandadze commented on the 17th anniversary of fall of Sokhumi in the war in Georgia`s occupied region Abkhazia. She also stressed importance of protecting rights of internally displace people. Ms. Kalandadze also summed up President Saakashvili`s speech delivered at the 65th UN General Assembly session in New York. The deputy minister commented on NATO Secretary General`s forthcoming visit to Georgia. Anders Fogh Rasmussen is arriving in Tbilisi on September 30. `The main internal as well as foreign challenge of the Georgian government remains protection of rights of internally displaced people`, the deputy minister said. Russia plans the WTO membership for 2011. The declaration was made by Putin while being in Berlin. He met with Angela Merkel. "No open questions remained so the Moscow may become a member of WTO. This is planned by the next year, " - Putin. For information, Putin pays an official visit to Germany. Secessionist Abkhazia's Interior Minister promised to expel all criminal authorities from Abkhazia. Lonid Dziapshba said the law enforcement bodies are taking very serious steps against the criminal authorities in Abkhazia. In conversation with Abkhazian journalists he noted that a few time ago from Russian Federation to Abkahzia the so-called criminal authority Irakli Buliskeria arrived. According to the information received by investigative bodies he was teaching the local criminal authorities about the rules of its circle. "The criminal authorities were gathered in Gagra. The interior Ministry's operative group was directed to them, but Georgian criminal authority Buliskiria left the place of gathering in time and hide in Russia. Other participants of the meeting were detained by law enforcers. Now they are in the predetention isolation, "- Interior Minister said on the press conference. He noted that after the expiration of the administrative punishment they will be obliged either to refuse the criminal authorities status or to leave the Republic. He promised to them not to give a calm life. Viktor Yanukovich President of Ukraine said Ukraine may enter the Customs Union were the Russia, Belarus and Kazakhstan are united, GHN reports. About the possibility of entering the Ukraine to the Customs Union Viktor Janukovich said on Friday on the press conference with Dimity Medvedev summarizing the Russian-Ukraine interstate commission sitting. The newspaper "Look" ("Vzglad") reads, seems like he is not embarrassed even with the necessity for Constitutional changes in this respect. Namely the entering to the Customs Union was named by Russian side as a precondition for the lowering of prices to the gas for Ukraine. But for this the Constitutional changes are necessary in Ukraine. Janukovich said: "This is possible but we have to make some Constitutional amendments," - RIA Novosti informed. President of Ukraine said the talks are about the amendments that are possible and that are to be decided in Parliament and in the all Ukrainian referendum. The Russian President clearly stated that for the free trade agreement to the EU very long way is, in turn to the CU to Russian Federation there is no problem to enter. This question is a sovereign right of every state this is to be decided according to the economic considerations and the legal basis. Russia clearly stated its position in connection with the joining of Ukraine to the CU: "here are big economic considerations and better interactions in all possible areas - as political as well humanitarian ones." To be noted that earlier in spring the Moscow noted if Ukraine wishes a cheaper gas it has to integrate with Russian Federation. For information, Ukraine is already is a member of WTO and is negotiating about the free economic zone with EU. The Georgian Ministers of Energy and Economic conducted meetings in France with government and business representatives. Alexander Khetaguri and Vera Qobalia took part in the meeting of businessmen in Paris that is a biggest alliance of the manufacturers in France. Several companies - representatives of the business union are already operating in Georgia, some of them are going to start the operation and investment in our country. Vera Qobalia, Economic Minister said the next visit to France of Georgian delegation is planned for January of 2011. "We are feeling the big support from France. We would like to pay some visits in the French Finance Ministry and with the aides of Nicola Sarkozy. We will arrive here in January again and will meet with new Ministers, as recently in France a big government reshuffle happen, "- Qobalia said. Russian Foreign Minister Sergey Lavrov said he does not care about the possible leaking of the secret information to the internet edition Wikileaks.org. "In USA they are stealing the secret information, but such things do not happen in our establishments, at least in such quantities,"- Lavrov said. To the question if the State department does informed the Russian Foreign Ministry about the possible publication of such material Lavrov replied: "Seems like we were informed through the media. I did not read this yet." For the information, the internet edition Wikileaks administration is going to publish the facts about the corruptive dealing. The Journalists are saying they have accessed the documents get by the USA intelligence, were the talks are about the existing political situation in Russia and about the corruptive dealings between politicians. The document encompasses dialogues of USA diplomats with Russian politicians and the analysis of all important events in Russia and the internal and foreign policy analysis. In connection with this document the special declaration was made by USA State Department. It noted that the publication of this document may invoke a sever blow to the relations of Russia and USA. Temur Shashiashvili, chairman of "Whites" invites Irakli Alasania, leader of the "Free Democrats" to the political duel. Shashiashvili is confronting Alasania for the declaration that the Public Gathering is only for the street protest actions and the leaders of this union are only the street politicians. "This duel inevitably will be held. Maybe we both will loose, but the time for the fight will come and I will fight with Alasania, "- Shashiashvili said today on the press conference. At the same time Shashiashvili blamed Alasania in cooperation with Kremlin in turn. In Moscow the dagestanisans opened a fire upon by passers in Moscow. The incident happen in the South-Eastern part of the Moscow. The information is disseminated by Russian media and a source of information is laweforcing bodies. According to the information to the militia a man presented an accusation against Dagestan origin person who opened a fire from the traumatic weapon over the bypassing sister and friend of him. The person who opens the fire was sitting in the car at the same time. The car owner is detected this is a 26 years old man originally from Derbent. The employment and the education are two main priorities of the country. It takes not much time to understand that for decision of first question the other is necessary. The education reform is a Rose revolution's main task. The Common National Exams appeared to be quite successful. Nevertheless quite another question is how far successful will be the knowledge given to students by different high schools. And the other question is that Georgian state officials and heads of big companies are not much satisfied with the Georgian young people with Georgian higher schools education. More over setting such criteria they are discrediting the Georgian education and the image of the country. In Georgia one can find only 2-3 uncorrupted ministries and its subordinated bodies no more. The Georgian business is not less corrupted as well. Now any company be it the pharmaceutical or trade-commercial when taking new employers for interview are demanding one and the same test in General abilities - this is something like a modern style, as if the guys are thinking like the governmental figures. At the same time the announcers of the vacancy are less interests with the real professional abilities of the future employee. First of all namely this question makes the competitions for the vacancies to look like an absurd theatre. For example if you need to hire in your company a lawyer you have to be interested can this person pass the test for general abilities but not with the concrete question what he will do in your company as a lawyer, is he a professional in his area speaks he foreign languages and so on. Also, there is a discrimination of Georgian education when employers are demanding the foreign educated professionals refusing the Georgian high schools graduates. Such companies announcing the vacancy only for the foreign educated ones are discriminating thousands of counterparts. The interesting point is as well when the companies are demanding the passing of the General Abilities Test when hiring new staff. It seems like future employees are obliged to pass this test twice - ones during the actual state exams and secondly when such demagogic demand is announced by company heads. Will be strange enough if such test will be connected with the activity of high professional in cyber science for example and the test has to pass employee with legal education. Or contrary need cyber scientist to pass the legal matters test? To think about the payment abilities of our counterparts only 1 percent of population can afford the foreign education nowadays. But the problem is quite another, if the official state bodies are not recognizing the Georgian high education, then why the government spends so much money for the financing of students and magistrates? The news agency GHN conducted an experiment sending the different kind CV for 134 vacancies, only one response was received from Public Defender's Office at the end explaining that the candidate is not appropriate for the concrete vacancy. In other case the excellent CVs were sent and no company from 133 did not responded. This makes us be doubtful with the sincerity of vacancy announcers. Do they indeed need to hire someone? Our cadre's policy will be with zero percent nepotism. One of the curios happening s in this respect was that one of the potential employees who passed successfully all stages of hiring process and examinations get a response from Minister - no this person too young. The main is that there was not a nepotism and argumentation strongest. Likewise, President as well could discard her candidacy for her youngness. In such case Vera Qobalia could not became a Stable Development Minister. One more example, when it was necessary for her she refused to conduct a competition for vacancy and directly appointed a person to the post of National investment Agency head by own decision. Keti Bochorishvili said to GHN that she did not participate in any competitions. "What about my appointment, I simply presented my own vision and plan for the development of the agency my plan was approved, my experience in the field was taken into consideration and I was called for the apomiment to the position. It is strange a bit, but it was like this: "I wrote, presented and won!" "We have a definite plan we have to rise our economy, to strengthen the small business, to drug investments and tourists to our country and of coerce we have to create new employment opportunities. We have to decrease the unemployment, " - Vera Qobalia has had declared when the competitions were declared for the vacancies. Now about the main theme. Recently , the Economic Minster declared that for the taking the office of the deputy head of Legal Department in the Ministry and the leading specialist of the same department one needs be foreign educated to have "Maser's degree in law - LLM degree taken in EU or USA". From this is becomes clear that Vera Qobalia doesn't recognizes not only the Georgian education, but as well she does not recognizes the any other degrees issues by Israel, Turkey, Canada and so on. Such declarations can be tolerated somehow from the private sector business, as there is not a law prohibiting this, but the same actions from the official bodies are strange enough and immoral. The doubt is quite big that for the above mentioned position the beforehand selected own candidacy was predetermined. And one more snake! In most cases the different bodies and companies even are not declaring how high is the passing point for the competition for the vacancy. They are making the barriers as they wish for own cases. In such circumstances there is not a hope for thousands of people that there is some fineness in the country, and the various competitions for the vacancies are only for the façade. For what was I studying? This question is posed frequently by young people, who are desperately looking for the job in own specialty after the accomplishment of the university. But those who guess earlier the uselessness of the studying marathon in Georgia are looking for the solution abroad. In principle no other ways are possible. In the country were young person is not accepted for the job because of his youngness but not because of his knowledge and was told "go from here with your Georgian education", one can think seriously that Georgian education is stably no perspective. WikiLeaks released the classified documents that are answering Azerbaijan. This time the correspondence of Donald Lu, USA envoy to Azerbaijan is published. It is dated of August 22 of 2008. It touches the attitude of Ilham Aliev towards Georgian president. The letter published by WikiLeaks said that Aliev after the several hours talks with British Petroleum director in Baku Andrew Englis said that Baku upholds Georgia, at the same time Aliev abstains from the open upholding of Saakashvili. At the same time Aliev said that for Baku it is very important to restore the railway bridges that were destroyed by Russian Federation during the August war. He called to Moscow during he war and asked to not to allow the destruction of gas pipeline and Kulevi terminal on the territory of which the Azerbaijani population was settled. According to the released classified materials Aliev said that he was going to sale the oil and gas to the West, as well the part of the gas he was intended to sale for Russia and the oil for Iran. He admitted that he could sale for Russia 2 mlrd meters in cube for Russia "for the pressure over Turkey" for the favorable transit agreement of gas for Baku. The letter as well said that in conversation wit BP director in Baku Aliev said that "I was not in a hurry to uphold Saakashvili, as this will not decide anything give him any favor." Today on December 19 the Oethodox Chirch marks the day of St. Nikolaos Wonderworker, Bishop of Myra. The Saint according to the blessing of Illia Second, Cathalocos Partiarch of All Gerogia is a patron of Gerogian Church. St Nokolais was born in the VI century AD in Greece. 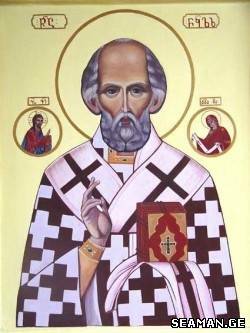 Under the Roman Emperor, who ruthlessly persecuted Christians, Bishop Nicholas suffered for his faith, was exiled and imprisoned. The prisons were so full of bishops, priests, and deacons, there was no room for the real criminals-murderers, thieves and robbers. He died December 6, AD 343 in Myra and was buried in his cathedral church, where a unique, liquid appeared in his grave. This liquid substance, have healing powers, fostered the growth of devotion to Nicholas. The anniversary of his death became a day of celebration, December 6th (December 19 on the Julian Calendar).